One of the ten or so, islands you can drive to from Okinawa, is Kouri-jima. While Chris Wilson was photographing this gal, I sneaked a few shots. It's only Monday but, I'm calling this image my Lady of the Week photo. That's because, I know, I won't find anyone sweeter, even if I try. She's only 4 years shy of being 100 and, still laughs and smiles. 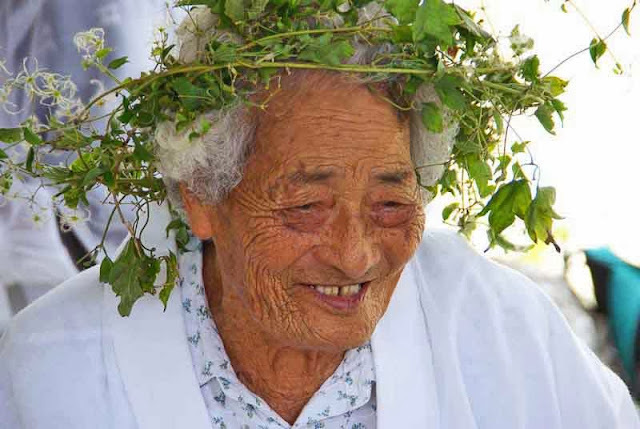 The crown on her head, is made from a plant, called Ryukyu Botanzuru. So, I figure, I should go out and find some of that stuff. Read more about the Lady of the Week on Chris Wilson's Travel Blog.